While in our own galaxy, the Milky Way, the central black hole was measured to have about 4 million solar masses, the 199 galaxies analysed now host black holes with a typical mass of about 300 million solar masses. These galaxies are much larger than our Milky Way and they are "active", which means that the inner region of the galaxy has a much higher luminosity than normal. Astronomers believe that this radiation is powered by the accretion of matter on the super-massive black hole. Previous studies suggest that the formation and evolution of the host galaxies and their black holes are closely connected. However, there are various possibilities as to how the interstellar gas could be funnelled towards the black hole, and it is unclear which of these mechanisms is dominant at what stage in the evolution of a galaxy. 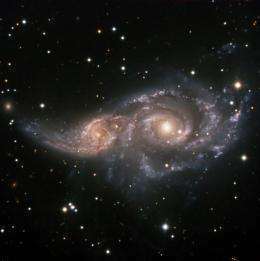 The two main mechanisms discussed are either internal disruptions, such as galaxy disk instabilities, or mergers and tidal interactions between close pairs of galaxies. Simulations of these scenarios lead to different predictions about the clustering of active galaxies and the masses of the host galaxies. Previous studies have analysed active galaxies selected by their optical or soft X-ray emission, which misses a major part of the radiation powered by the black hole accretion due to absorption and other effects. "For our sample we used galaxies selected by their hard X-ray emission in the Swift-BAT all-sky survey, which provides an unprecedented depth and characterizations of source properties," says Nico Cappelluti from the Max Planck Institute for Extraterrestrial Physics, the lead author of the study. "With this survey we have a complete sample of local active galaxies - and so we can perform the measurement of black holes and the dark matter halos which host them in our ‘cosmological backyard’," adds Marco Ajello, co-author from the Kavli Institute of Particle Astrophysics and Cosmology in Stanford, USA. The clustering analysis of the 199 galaxies thus selected now for the first time gives an unbiased picture of the coexistence and evolution of galaxies and their active nuclei in the local universe. The scientists estimate that the black holes powering the active galaxies have a typical mass of about 300 million solar masses and are hosted by massive galaxies with about 200 billion solar masses residing in big bubbles of dark matter as massive as 100 Milky Ways. These properties scale with luminosity, i.e. the more luminous sources are hosted in more massive galaxies with bigger black holes. By merging the observational evidence and theoretical model predictions, the scientists found that the most plausible scenario for the history of local active galaxies is a merger event: "The active galactic nuclei ‘switch on’ after a major merger event about 700 million years ago and shine brightly for the first part of their lives where they gain most of their mass," explains Cappelluti. "After about 200 to 500 million years they accrete with lower and lower efficiency as the gas reservoirs become depleted. Today, they have grown to super-massive black holes with 100 to 1000 million solar masses and shine with moderately low luminosity compared to other active galaxies." The black holes "starve" as their gas supply becomes less and less. These results, which will be published in the renowned Astrophysical Journal, provide an important contribution to our understanding of the origin of super-massive black holes shining at the centres of galaxies that have been puzzling astronomers for almost a century. In the coming years the new generation X-ray telescopes, such as eROSITA which is currently under construction at the Max Planck Institute for Extraterrestrial Physics, will perform further mappings of black holes and dark matter. These new studies will open up new perspectives on the history of the most exotic phenomena in the Universe. You can count anti Down part make daily 7 starring, to be read downunder my website of our seven days. Not at all realy black ore a real bang exist on my blog, but life.